RIVERSIDE >> Charles Callison and the San Bernardino Valley Wolverines defeated the Antelope Valley Marauders, 64-57, to advance into the second round of the Riverside City College Holiday Tournament. Callison scored 17 points and had three rebounds for the Wolverines, while teammate Todd Lewis contributed with 12 points and seven rebounds. Brewer also mentioned that the Marauders style of play bother the Wolverines’ defense early in the game. Callison managed work around the defense scoring eight of his ten points in the final two minutes of the first half. The Wolverines defense was tested by the Marauders offensive attack that attempted 28 three point attempts. 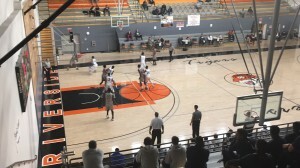 Tim Gilmore scored 14 points and made four of his eight attempted shots from the three point line for the Marauders. Adrian Francis contributed with 11 points and was 3-for-8 from the three point line. Lawrence White scored 12 of his 15 total points during the second half for the Marauders. White hit a three point shot for the Marauders with 38 seconds left in the second half to bring the game within two points of the Wolverines but could not pull ahead for the win. The Wolverines will play Fullerton College at 3 p.m. Thursday in the RCC Wheelock Gym. Player of Year – Gerry Blakes, San Bernardino Valley, Soph. Kevin Lawson, Victor Valley, Soph. Leo Maidana, Rio Hondo, Fresh. Keith Smith, San Bernardino Valley, Soph. Shawn Benn, Rio Hondo, Fresh. Charles Callison, San Bernardino Valley, Fresh. Tymarieh Dixon, San Bernardino Valley, Soph. Kimani Lane, Victor Valley, Fresh. San Bernardino Valley has two more soccer players moving on to the next level and they’ll be playing against each other when they get to those respective schools. Midfielder Maria Navarro (Ontario H.S.) has chosen to stay close to home at Cal Poly Pomona while and defender Basha Greer (Valley View) will be off to Humboldt State. Navarro was named first team All-Foothill Conference this past fall and scoring nine goals with seven assists, including two game winning goals. She was also named to the 2012 first team All-Foothill Conference. Greer was an integral part of anchoring a defense that put together 12 shutouts, including four straight from Nov. 1 to Nov. 12th. SBVC, led by coach Kristin Hauge, won its fifth Foothill Conference Championship and made a seventh straight playoff appearance. The team finished the year with a 17-3-2 overall record and a 9-1 conference record.